Another busy day awaits on Friday at the 2014 World Series of Poker, bookended by the start of two relatively unique events on the 65-tourney schedule. Starting early at 10 a.m. today will be the ever-popular Event #17: $1,000 Seniors No-Limit Hold’em Championship which will likely attract one of the bigger turnouts of the WSOP thus far. Then later in the afternoon comes an event which will no doubt draw one of the smaller fields of the summer, the Event #18: $10,000 Seven-Card Razz Championship. Dan Hirleman of Tempe, Arizona returns to the start-of-Day-3 chip lead among the final 26 in Event #14, with James Bucci of Hollywood, Maryland his closest challenger. This marks Hirleman’s 14th career WSOP cash with his best-ever previous showing being a ninth-place finish in a $5K six-handed no-limit hold’em event in 2011. Bucci meanwhile has 10 cashes and three previous WSOP final tables to his credit dating back to 1990. 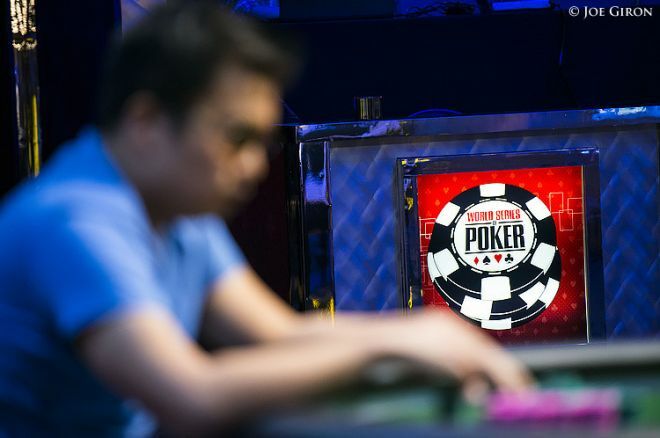 The chase pack includes a number of WSOP bracelet holders, with Konstantin Puchkov, Dan Heimiller, Frankie O’Dell (who has won two), and 2004 WSOP Main Event Champion Greg Raymer all returning to top 10 stacks. Of these players, O’Dell is the only one with Omaha Hi/Low wins to his credit, with both of his bracelets coming in the discipline in 2003 and 2007. Sitting just outside the top 10 is another WSOP bracelet winner, Gary Benson, with last year’s champ in this same event Calen McNeil just a couple of spots back as well after having begun Day 2 with less than four big bets. Hoping to emulate McNeil’s ability to climb back from short-stacked status today will be Maria Ho and Chris Tryba, both of whom will begin among the short stacks at the bottom of the counts. Play resumes at 1 p.m. PDT today. Start checking the Event #14 live updates then as we find out together who will win the $283,275 first prize and next 2014 WSOP bracelet. Meanwhile 144 will return this afternoon for the second day of action in Event #15: $3,000 Six-Handed No-Limit Hold’em, survivors of the 810 who entered the event. Only the top 90 make the cash, so the story early today will be of the bubble bursting, then tonight the focus will shift toward who makes tomorrow’s final scheduled day of play. Brandon Cantu returns with the chip lead among those 144. Cantu already has one WSOP final table this year with a sixth-place finish in Event #7: Seven-Card Razz. Cantu has two WSOP gold bracelets and over $4 million in lifetime tourney winnings, although some including Phil Hellmuth speaking to us a few days ago nonetheless maintain Cantu remains an “underrated” player. In any case, it should prove interesting to watch Cantu’s progress today, as well as that of Barry Hutter, Andreas Hoivold, Davidi Kitai, Byron Kaverman, Chris Hunichen, and Michael Mizrachi, all of whom are among those returning to big stacks as well. The big $508,640 first prize awaiting the winner of this one also adds an extra layer of intrigue to Event #15. They’ll get started at 2 p.m. local time in this one, which is when the Event #15 live updates will begin. There were 348 entrants in Event #16: $1,500 Limit 2-7 Triple Draw Lowball, an event which last year sported a $2,500 price tag when 282 took part. That meant this year’s prize pool of $469,800 comes under the $641,500 total from a year ago. The top 36 finishers make the money in Event #16 with $124,510 due the winner. Just 51 are left to return today, meaning the cash bubble will likely burst within the first level or two. Mike Leah will unbag the most chips to start play, with Dan Smith, Jason Mercier, Ismael Bojang, Ben Yu, and Naoya Kihara also coming back to above average stacks. The discards and draws begin once more at 3 p.m. today, with the Event #16 live updates following all the action as they play down to what will likely be close to a final table today. The first of two new events today will kick off early with the $1,000 buy-in Seniors event getting underway at 10 a.m. The Seniors event is not an “open” bracelet event insofar as it is reserved for players aged 50 and older, but that limitation has done little to prevent the fields from growing year after year. Indeed, at recent WSOPs the Seniors event has been one of the highest attended, and has produced some of the biggest prize pools and first prizes, too. 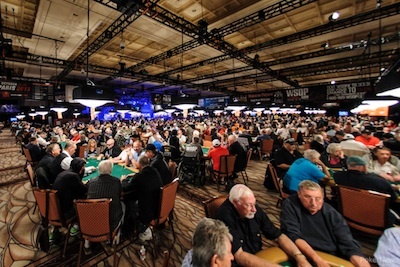 Introduced in 2001, the Seniors event has seen fields increase every year since 2003, with the 4,407 who played last year representing the fourth-largest field of the 2013 WSOP behind the Main Event (6,352), the “Millionaire Maker” (6,343), and the “Little One for One Drop” (4,756), with the latter two events featuring re-entries (including unlimited re-entries for the first four levels in the case of the “Little One”). Tune it at 10 a.m. for the Event #17 live updates and see if the Seniors can continue that decade-long streak of field increases. Finally, the next “Championship” event on the schedule gets going later in the afternoon today with Event #18: $10,000 Seven-Card Razz, a tournament very likely to be the first-ever instance of a razz tournament with such a large entry fee. While the Seniors event will undoubtedly be huge, this one appears destined to attract an intimate gathering of dedicated razz players with the bankrolls to support the buy-in. Tune it starting at 4:00 p.m. today when the Event #18 live updates will begin to see who turns out for the razz event, one that will surely draw numerous notables.